Quevega’s place among racing’s great mares took another step up today when she won her fourth race at the Festival. All her victories have come in the David Nicholson Mares’ Hurdle, sponsored this year by OLBG, and she has been ridden each time by Ruby Walsh for trainer Willie Mullins and owners the Hammer And Trowel Syndicate. Her win today was some consolation for the Mullins’ stable, which had seen odds-on favourite Hurricane Fly beaten in the Stan James Champion Hurdle and then lost Scotsirish after he was put down during the Glenfarclas Chase. 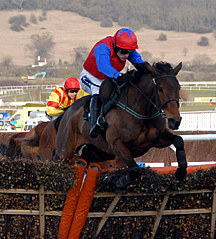 Quevega rarely runs often, and this was her seasonal debut. Mullins said: “She’s an extraordinary mare to come out every year without a previous run, and to do it like she did today is amazing. They were tightly packed coming down the hill, and my mother asked Ruby how he held his nerve. He said, ‘Well, I had nowhere else to go’. “She has a beautiful temperament. Every day I send her out to do something and she does it willingly. If she does too much work she lets me know the following day - she doesn’t eat up and she has her own way of doing things. Mullins is often asked why he doesn’t run Quevega in the Ladbrokes World Hurdle, and it was an obvious question again. He said: “If you own a horse that good’s enough to win at Cheltenham you run it in the race it’s good enough to win. If she had run in other races she might have finished second or third and not won four times at the Festival. I know she can win the Stayers’ Hurdle in Ireland, but this race is made for her at this meeting. 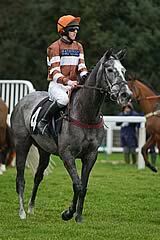 Kentford Grey Lady is a six-year-old daughter of recently-deceased St Leger hero Silver Patriarch. 1. This year sees the fifth running of the Grade Two OLBG Mares’ Hurdle (for the David Nicholson Trophy). The trophy is named in memory of the legendary Cotswold-based jockey and trainer, who passed away in August, 2006. OLBG.com sponsors for the first time in 2012. 2. “The Duke” enjoyed five successes at The Festival as a jockey between 1963 and 1973, but is best known for his 17 victories as a trainer, including victories in the sportingbet.com Queen Mother Champion Chase (1994 & 1995 Viking Flagship), Ladbrokes World Hurdle (Anzum 1999) and Betfred Cheltenham Gold Cup (1988 Charter Party). 3. Nicholson became the first trainer for more than 50 years to saddle three winners in a day at The Festival when Putty Road (Neptune Investment Management Novices’ Hurdle), Viking Flagship (sportingbet.com Queen Mother Champion Chase) and Kadi (Byrne Group Plate) all triumphed on March 15, 1995. 4. The remarkable mare Quevega, owned by the Hammer & Trowel Syndicate and trained by Willie Mullins in Ireland, has won the last three runnings in great style when sent off favourite each time. She goes for a fourth victory this year.